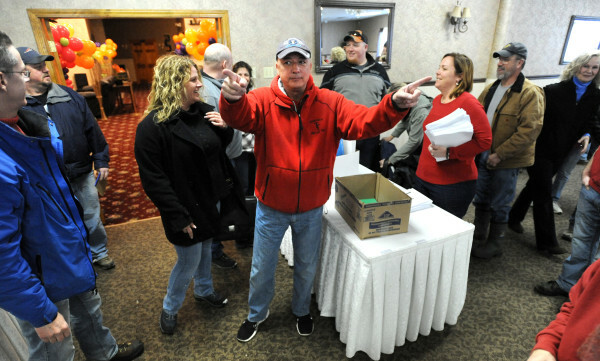 Don Trementozzi (center), president of the Communication Workers of America Local 1400, acknowledges cheers as he enters the room at the Spectacular Event Center in Bangor in this Feb. 20, 2015, file photo. PORTLAND, Maine — FairPoint CEO Paul Sunu said mergers and acquisitions are in the mix for the long-term strategy of the telecom provider with a broad footprint in Maine and Northern New England. “Understanding the reality of a consolidating industry with intense competition and secular headwinds, we must consider mergers and acquisitions as either a seller or a buyer as part of our overall strategy,” Sunu said. The company’s sale has been a point of concern for policymakers in Maine, who in 2014 sought to strengthen the state’s regulatory review of any such merger. Union officials said in February after the conclusion of a 131-day strike that they felt concessions given in the new contract make the company more attractive to prospective buyers. Sunu’s status report came as the company’s net income loss for the first quarter deepened from last year to $45.2 million, compared with $32.2 million for the first quarter of 2014. The drop came as the company’s operating expenses with a contingency workforce during the harsh winter were higher than expected, at around $49 million, and the company had a revenue decline of about $17 million, primarily from its voice services. The company attributed that decline to a lower number of lines and less long-distance use. FairPoint also saw a decline in revenue from fees for access to its copper wire networks. The company reported a decline in residential voice access lines and broadband subscribers compared with one year ago. The company’s residential customers dropped to about 452,302 as of March 31, 2015, compared with 516,106 on the same date in 2014. For the same dates, broadband customers were down to 318,378 from 331,538 one year ago.